Ho hum, it look like USDJPY is just pacing back and forth between resistance around 83.80 and support at 83.20. The stochastic is still rising, which means that the pair could climb until the resistance level again. The question is, would it bounce or breakout this time? If that resistance level holds, the pair could sink back until 83.20 and form another bottom. Wait a minute. 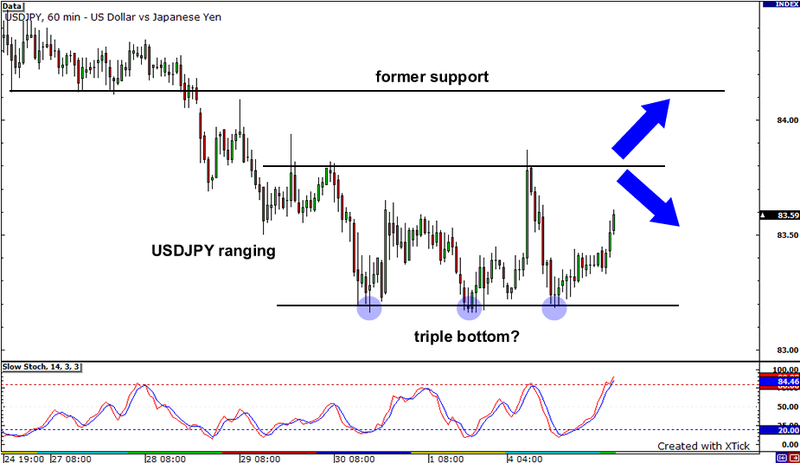 That looks like a triple bottom formation and, according to Forexpedia, that could be a reversal signal! Well, if the pair breaks above the 83.80 neckline, it could rally until the former support level near 84.15. What’s crackin’ dawg? 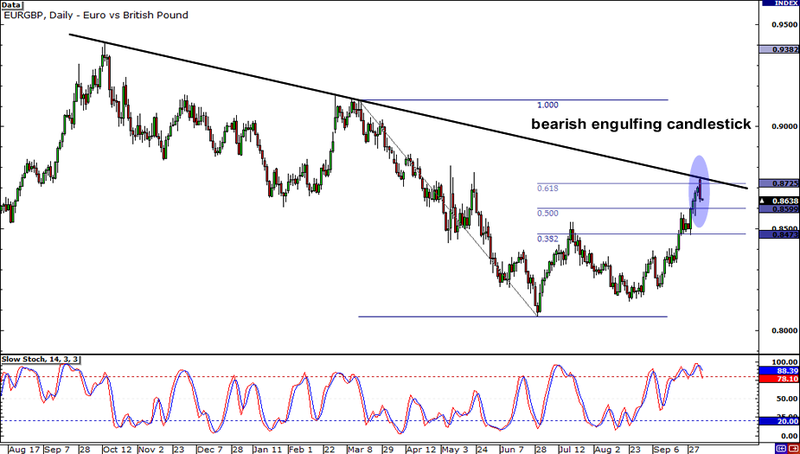 I’ll tell you what–that wicked setup on EURGBP! Yo, check it. The pair’s been on a downtrend on the daily chart for as long as I can remember. Right now it can’t seem to get past .8750, which is right about where the falling trend line meets the 61.8% Fibonacci retracement level. It’s starting to look like the pair’s setting up to take a dip judging by that bearish engulfing candlestick. If you’re feeling the bears on this one and want to go short, the area of recent lows looks like a good target at around .8150. But if you wanna side with the bulls, then you may want to aim high and set your goal at the .9100 former resistance level. Did someone call for an ascending triangle? ‘Coz AUDJPY be dishin’ ’em out, son! By the way it’s been testing the 81.30 handle and creating higher lows, the pair looks poised to break higher. Today might just be its lucky day, too. The RBA is set to make its interest rate decision, which is a potential market mover. If you’re feeling bullish, you may want to wait until candlesticks start to close above the triangle before you buy the pair and aim for new highs. 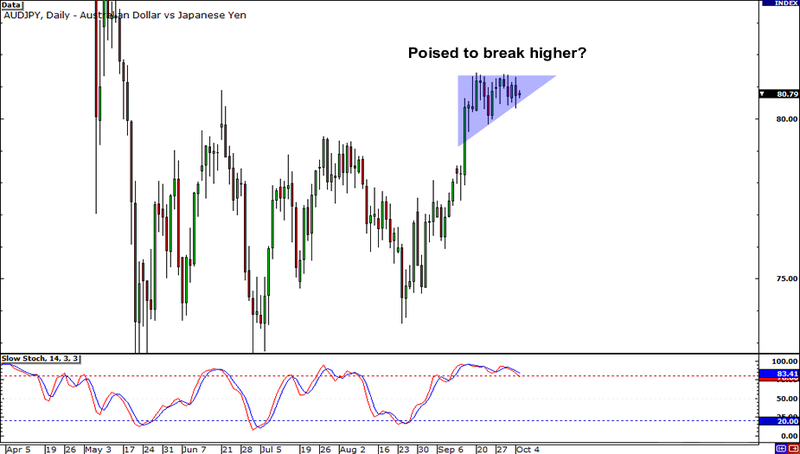 On the other hand, if you think AUDJPY can’t rise any higher, resistance at 79.50 may provide support for the pair.